UIS continues to extend its vision beyond the boundaries of Springfield and Illinois in order to better prepare its students for their local and global responsibilities. The Global Experience Program has included UIS study abroad seminars and exchange programs as well as programs administered by other universities and educational institutions. UIS has developed short-term study abroad programs in Australia, Botswana, Canada, China, The Gambia, Germany, Greece, Jamaica, Japan, Mexico, Nicaragua, Poland, Romania, and the United Kingdom. International Programs at UIS is part of a global web of communication, travel and trade. As a public affairs institution dedicated to serving the needs and aspirations of the people of Illinois, UIS continues to extend its vision beyond the boundaries of Springfield and Illinois in order to better prepare its students for their local and global responsibilities. Isabel Ly Payia, a biology major with a pre-med focus, and minoring in chemistry, always wanted to study abroad. Thanks to financial assistance at UIS, she had the opportunity to when she traveled to South Korea and Japan. John Billimack, a UIS graduate student in history who hoped to work in a museum and perform his own research, chose to study abroad because he believed it could give a tremendous amount of perspective and appreciation for the world around him. Whanhee Park, an international student from South Korea studying at UIS, spent time in Japan as part of the UIS study abroad program. He believes studying abroad is a unique opportunity to learn while being fully engrossed in a new culture. “I believe that this trip to study in Japan will expose me to the cultures of Japan that I missed as a child and equip me with the knowledge needed for a successful future,” he says. Lorah Hoe chose to study in Northern Ireland because of their conflict transformation studies. The conflict transformation studies takes a look at Northern Ireland’s most recent history during conflict but also peace. She chose Northern Ireland to better understand how peace can be achieved in other countries all over the world. Aashay Chavan took finance courses in Milan, Italy. A graduate student in Public Administration, he chose to study in Milan because he started learning Italian and thought what better way to absorb the language than to live in the country. He also wanted to attend the World Expo in Milan. Rebekah Lange, a communications major and history and theatre minor, spent the summer in London at the University of Roehampton. She’s wanted to visit England since she was fourteen-years-old because of the history and culture to be found there. When she learned about the study abroad opportunity at UIS, she grabbed it. Jennifer Hickey, a social work major, spent the summer in Heredia, Costa Rica. She is interested in child and family services, and chose to study abroad so she could immerse herself in a new culture, and expose herself to different child rearing and parenting practices. Biniyam Melesse spent part of his summer studying in Be’er Sheva, Israel. A graduate student in the UIS Public Health-Environmental Health program, he chose to study abroad because he wanted to broaden his perspective in terms of public health. 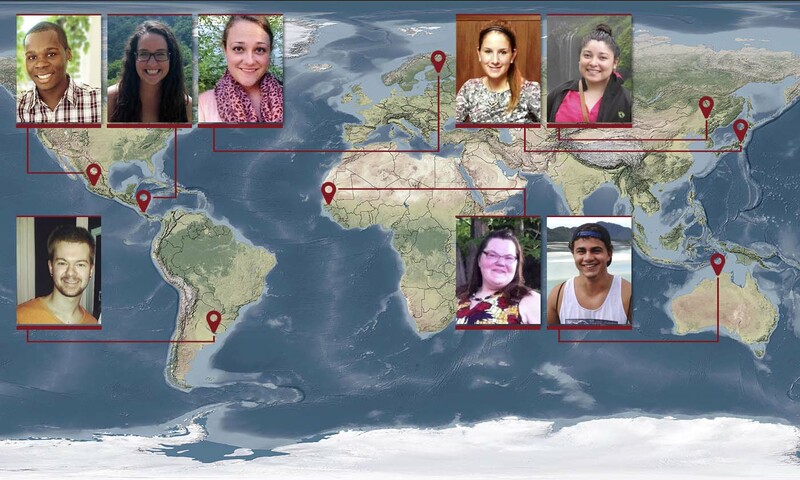 Many students finished their 2014 study abroad experiences before the start of the new academic year. For those who took the opportunity, they returned with new friendships and a more nuanced way of looking at the world. Top row, L-R: Dexter Burns – Mexico; Shelby Bedford – China, South Korea, Japan; Hannah Cave – Finland; Hunter Westbrook – Japan; Kerry Portillo-Lopez – China. Bottom row, L-R: Matt Dobill – Argentina; Bridget Donley – The Gambia; Ryan Walsh – Australia.